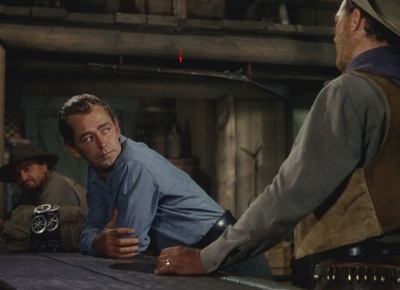 * I was talking to a couple of male friends about how you don't really see a lot of pub fights anymore, not like the ones we used to see (or find ourselves mixed up) years ago. We couldn't decide whether we just getting older, or going to a better class of bar. But one thing we could agree on, the way our father's generation held themselves, reacted to aggression and dealt with other men who crossed them is no longer acceptable in modern society. And that's a good thing. But I do feel that it's resulted in a lot of confusion.... so this is a bit more personal than my usual stories, but don't worry, it'll be back to your regular service shortly. "Were You Looking at My Girlfriend's Pint?" * Here's a thing about me.... something that only those who really know me are aware of.... I have a nasty, volcanic temper. Always had, still do. It's a part of my make-up I only became aware of when I was a young teenager, when I got into my first serious schoolyard fight, with a guy who was a bit of a bully but really only a fool. And once we got into it, I felt a sudden rush of rage and adrenaline. I didn't want to hurt the guy, I wanted to kill him. And I might have really hurt him if some other kids hadn't dragged me off. It was a very strange feeling, one that many boys become aware of in their first serious fight, the realisation that you have it within yourself to seriously hurt another person, that there is a deep well of anger that you were never aware of and can't really control. We grew up in a very old school, rough and tumble working class part of the city. And we learned from our fathers, when you are challenged, never back down. Never show weakness, always hit back. And hit back as hard and as fast as you can. It was drilled into us by the men in our family (I had six uncles on my dad's side alone) and by the Christian Brothers who gave us a rough education (if you don't know, the Christian Brothers educated generations of Irish boys - they were mostly hard, violent men. Sort of the Paramilitary Wing of the Catholic Church). We learnt it on the sports field, in hurling (the violently rapid Irish game with stick and ball). Guys with skill were admired, guys who were prepared to put their heads or fists into places they shouldn't were idolised. Many of the older men in our lives, fathers, uncles, grandfathers, teachers, sports coaches, had either lived through or were one generation away from a society bathed in terrible violence - the War of Independence and the bitter, fratricidal Civil War that followed. Or they had themselves been brutalised by the schools and the hard, poor, repressed world they grew up in. And they idolised Hard Men, from John Wayne and Jack Dempsey to the Old IRA - ruthless guerrillas, terrorists or freedom fighters - depending on your point of view. In Cork, my home-town, many homes had a portrait of the Republican military leader Michael Collins, hanging next to ones of John Kennedy and the Pope - the Cork/Irish Holy Trinity. Collins was a genius but also a ruthless killer. 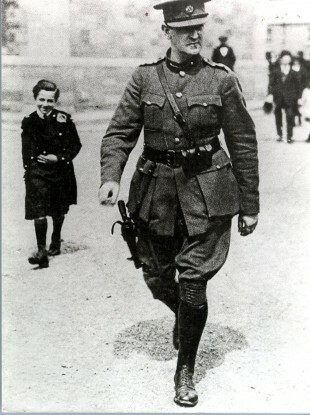 And Cork people were proud to have as their national hero a man who wasn't prepared to play by the rules of warfare. You send one of ours to the hospital, we send two of yours to the morgue. As a very young child, I was ushered into the presence of veteran IRA commander Tom Barry, told to shake the hand of a man (then very old but still with a military bearing) who had fought and killed for Ireland. So we learnt. Never back down. Always stand your ground. A man deals with problems with his fists. My own father was generally a very genial guy, but could go from 0-60mph in seconds. He had that thing which easily provoked men have, the face inside the face. In anger, the facial muscles would contract, the eyes widen and the jaw would stick out. He rarely if ever got into actual fights, but was always on his guard. Of course, this always being on edge, this code that I learnt, led to some pretty stupid fights. I didn't know how to back down - mostly I was too scared to - and there was always the Red Mist. And it was around the age of 17, after coming home once again with a torn shirt covered in blood (not mine, as I was quick to reassure my mother) that I decided this had to change. 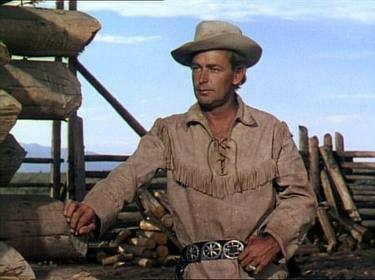 I remember seeing the great Alan Ladd movie Shane on TV roughly around this time and thinking; "That's what you want to be, the quiet guy who controls his temper. No pushover and nobody's fool, but not some Jack Palance eejit who just goes around causing trouble". So I've learnt to manage my anger. If anything, I've gone a bit too far in the other direction and tried to be the most genial, the most easy-going guy you'll meet. Which causes it's own problems, firstly, because fools will often mistake kindness for weakness and secondly because when, on the very rare occasion I do give way to the rage, it can be like a dam bursting. And I am still fearful that if I lose control some day over some stupid, nothing incident, I could end up harming myself or others. Somebody pushes past me in a pub and I have to fight the urge to get in his face. It still causes problems. I find it hard to back down, if somebody criticizes me, if somebody close to me points out a shortcoming, a mistake or unthoughtful behaviour, I feel that old rage, that Never Back Down! code, fighting to get out. The demon within. And I often have to go off for a bit and cool down. And realise that they were right and I'm in the wrong. So I need to deal with that. It's not healthy. But is a situation that I think a lot of men my age find themselves in. We didn't really get a lot of great coping mechanisms from our fathers (or father figures) and now we are living in a society that (thankfully) tends to frown on men who settle minor problems with the offer of a fist-fight in the car-park. There is a lot of confusion about what it means to be a man in this cockamanie world of ours. Strong but not rough, manly but in touch with your emotions, groomed but still recognisably a guy. It's not a cop out or an excuse to say this. It just feels like men are getting a lot of contradictory advice. Are we supposed to be Gok Wan or Russell Crowe (or a mix of the two, say David Beckham)? Of course, most women would like the idea of having Beckham around, but could you put up with the three-hour wait to get at the bathroom mirror every morning? And then there are the media role models - be more like Don Fecking Draper! Well, you try finding a tailor that good or the time to down a bottle of Scotch every day. Movies and the media, of course, still glamourise Hard Men, even if it is often with a veneer of irony. And one of the hottest sports around right now is Mixed Martial Arts, basically cage-fighting, Boxing without the dignity, skill or intelligence. Packaged, showbiz-infused Ultra Violence for a generation of men who are not allowed to express themselves with their fists. I was lucky in that I was mostly raised by my mother and my great Aunt Mamie - in fact, in was usual for boys where I came from to have a very matriarchal home, fathers were often absent, emotionally handicapped or simply not expected to join in with the child-rearing. We drew the best in our characters from the women in our lives. And still do today. And if you don't agree with me on that, I'll see you outside in two minutes. Joe, really enjoy your take on things, here and when you were on the Friday spot on Matt Cooper. Tis in all of us 'poor' Irish men, the rage that simmers just below...Thanks and keep up the good work. Good read Joe....totally disagree with you on mma v boxing though. As a fan of both to say mma is less skilled or intelligent is very misinformed....Surely mastering multiple disciplines as opposed to one requires more or equal amounts of skill/intelligence! I'd encourage you to go check out your local mma/bjj gym and then re-evaluate..... The cage is there for purely practical reasons, you can't have a ring as people would slide between the ropes when on the ground, I rarely hear people refer to boxing as 'ring fighting' but 'cage fighting' seems to carry a certain stigma. Anyway id encourage you to watch it next time with an open mind..... might not be your thing but try not to offer the lazy view that it's barbaric, brutal and lacks skill! Hiya - glad you enjoyed it - sport's very subjective, obvs - one man's meat and all that - and it may be I'm prejudiced because I've always been a boxing fan and MMA could endanger - so to speak - the future of boxing - but to be honest with you, I just can't get into the MMA stuff. And that's it! That was good, I think I remember your school, ... along there by the river. My brother went there. I went to St Maries of the Isle abs used to meet my brother on the walk to the bus stop. I feel sad when I pass by it now, I had a nice time but he experienced `The Leather ,circa 1980. Thanks - yep - sullivans quay - it's a beer garden now - i also went to st mary's of the isle - got the leather many times myself!